Plan of Improvements of Canal St. Park. This is a scarce 1871 map of Canal Park or Canal St. Park, New York City by Kellogg and Pilat. 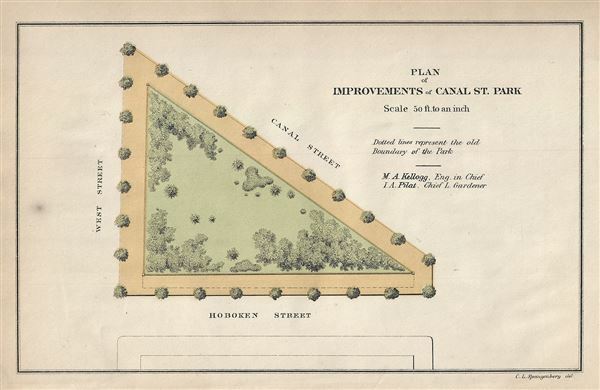 It shows the plan of improvements of Canal Street Park, located between Canal Street and West Street above Holland Tunnel. The map notes the location of trees and shrubbery within the triangular park. Originally established in 1686 by King James II, the area used to be part of the Lispenard Meadows and apparently used to be submerged during high tide. It was established in 1833 as public open space and operated as the Clinton County Market. In 1871, following this plan, the space was converted into a park. It would later be redesigned with an added path by famous landscape architect Calvery Vaux and Samuel Parson Jr, then Parks Superintendent, and opened to the public in 1888. In 1920, the park was closed 'temporarily' during the construction of the Holland Tunnel. This temporary closure however became permanent when Robert Moses, the former parks commissioner, closed it indefinitely in the hopes of building an elevated Canal St. Highway to the Manhattan Bridge. For nearly 80 year the park was disused until in 2005, it was finally restored and reopened to the public, retaining much of its 1888 design.